Purpose: Increasing number of older adults are receiving cancer surgeries especially for gastrointestinal cancers, which brings forth attention to age-related postoperative complication prevention. Postoperative delirium (POD) is a common complication that rises after surgical procedures involving general anesthesia, largely in the elderly population. Due to its sudden onset and fluctuating symptoms, POD often goes underdiagnosed and undertreated even though it may lead to various adverse outcomes. POD in GI cancer surgical elderly patients is poorly understood in terms of prevalence, pathophysiology, assessment, treatment and nursing management. We aimed to identify available literature and investigate study results to broaden our understanding of geriatric GI cancer POD. Methods: The search process involved six databases to identify relevant studies abided by inclusion criteria. Results: Eleven studies were selected for this review. Geriatric POD is closely related to frailty and surgical complications. Frailty increases vulnerability to surgical stress and causes cerebral changes that affect stress-regulating neurotransmitter proportions, brain blood flow, vascular density, neuron cell life and intracellular signal transductions. These conditions of frailty result in increased risks of surgical complications such as blood loss, cardiovascular events and inflammation, which all may lead to the POD. Mini Metal State Examination (MMSE), Confusion Assessment Method (CAM) and Delirium Rating Scale-revised-98 (DRS-R-98) are recommended for POD assessment to identify high-risk patients. Conclusion: The POD prevalence ranged from 8.2% to 51.0%. The multifactorial causative mechanism suggests nurses to identify high-risk elderly GI-cancer surgical patients by reviewing patient-specific factors and surgery-specific factors. Most malignancies are aging-related, which puts the increasing geriatric population more susceptible to cancer diagnosis. Gastrointestinal (GI) cancer including gastric, colorectal, pancreatic, biliary and hepatocellular carcinomas has been reported as one of the most prevalent malignancies with high mortality rate among this segment of population . Advanced medical technology has allowed increased indications for GI cancer-directed surgeries and cancer survivorship for the geriatric patients. However, age-related complications have made it difficult to provide postoperative nursing care. Postoperative delirium (POD) is one of the most common postsurgical complications that may be reversible and transient but can lead into adverse outcomes if not properly managed in a timely manner [2,3]. A missed management may lead into severe cognitive impairment and delayed independence, which may cause prolonged hospital stay, increased healthcare costs and possibly decreased quality of life . Limited strategies for its early detection, prevention and management threaten quintessential postoperative nursing care delivery . Several studies have reported concerns related to GI cancer among geriatrics and epidemiologic trends of aging population. Recent Korean national data reported that the average medical expenses among elderly population has doubled from year 2009 to 2016, which is in accordance with increased number of patients who have undergone surgical cancer procedures [6,7]. Also, newly diagnosed cancer population rose from 1.35 million in 2015 to 1.44 million in 2016, indicating 6.3% annual increase rate with 51.9% of the patients being elderly patients . The surgical cancer procedures that showed the greatest increased rate during the past 5 years in Korea were elective GI cancer surgeries . Most of the reported geriatric GI malignancy surgeries are elective instead of emergency procedures [1,8]. GI elective surgeries are scheduled for the purpose of malignant tumor removal and resection of nearby sites, whereas emergency surgeries are usually associated with ischemia, obstruction, hemorrhage, perforation and inflammation which may or may not be associated with cancer. About 60% of surgical procedures are reported to have performed on patients older than 65 . As advanced age is not a contraindication for GI malignancy surgery, the surgical rate is likely to increase. Although increased number of elderly have benefitted from receiving cancer-targeted surgical treatments, this population is more susceptible to postoperative complications compared to younger patients. They are more likely to be in poorer baseline health status associated with declined physiology, multiple comorbidities, polypharmacy and geriatric syndromes. Considering increased surgical cases among this population, preventative nursing measures for postsurgical age-related complications are crucial. Although researchers have identified POD as an independent factor that causes considerable complications, its complex nature and sudden onset make it challenging to achieve early detection and prompt treatment . Bedside nurses are most likely to notice early signs of POD with proper assessments. However, as exemplified by one study, as much as 69% of incidents were unrecognized by nurses, which raises great concerns for missed and inappropriate nursing care . Most of the past studies have mainly focused on identifying POD among cardiothoracic and orthopedic patients exclusively in intensive care unit (ICU) settings. Now that increased number of geriatric patients are being indicated for elective GI cancer surgeries and spending critically ill postoperative period in ward settings, current knowledge on POD that identify predisposing factors to predict the occurrence should be evaluated. A clear understanding of POD pathways, signs and symptoms will guide nurses to achieve preventative measures and timely treatment. In view of this, the aim of this integrative review was to examine prevalence, pathophysiology, assessment, treatment and nursing management of POD in geriatric elective GI cancer surgical patients in ward settings. This integrative review was conducted to offer a systematic synthesis of available literature regarding ward-based POD in geriatric elective GI cancer surgical patients following the guidelines of PRISMA statement. Two researchers (DP and SCK) and an experienced librarian independently extracted data before duplicate removal, and the study qualities were evaluated by each researcher. Initially, each researcher independently screened 10% of a random sample of citations to ensure adequate inter-rater agreement. Disagreements between researchers were resolved by a joint review of the articles to reach consensus; otherwise, a third reviewer was available to make a final decision. The integrative review question was developed using PICO (Population/ problem, Intervention/exposure, Comparison, Outcome) model. A two-phase approach was performed to expedite the literature search procedure with an effort to remain rigorous but to prevent bias. After data extraction process was performed, reference lists of identified articles were reviewed and relevant studies not revealed in the first phase were identified. This snowball technique was primarily performed by one of the authors (DP). Searches were performed using the Embase, MEDLINE, CINAHL, Cochrane Library, and Web of Science databases for articles published in English or Korean. As for the methodology, both quantitative and qualitative studies were searched for inclusion. Additional studies revealed from reference list check were identified using Google Scholar. The electronic search strategy had combination of the following components: 1) postoperative delirium; 2) confusion; 3) delirium; 4) cognitive dysfunction; 5) postoperative cognitive; 6) postoperative cognitive dysfunction; 7) elective abdominal surgery; 8) abdominal surgery; 9) surgery; 10) operation; 11) intervention; 12) nursing intervention; 13) nursing. The date of the final search was January 12, 2018. Studies were eligible if they included geriatric patient population (≥ 65 years) who have undergone elective GI cancer surgical procedures and reported prognostic factors associated with POD. Any assessment methods to capture and diagnose POD were eligible, and all definitions of each prognostic factor were included. Studies were excluded if they focused on non-geriatric patients such as pediatric or working-age population, studied non-GI surgeries or non-cancer surgeries, or if the study setting was not ward-based. Studies in languages other than English or Korean were excluded as well. After scanning the title and abstract, studies that did not present data outcomes related to the prevention of POD or adverse events were discarded. Although there is no gold standard for evaluating, calculating and interpreting methodological quality in integrative reviews, it is recommended to critically appraise the literature using quality scores to inform data analysis on methodological rigor and data relevance . We assessed included studies based on the contribution of data, and rated for overall methodological rigor and data relevance according to Whittemore and Knafl’s model . Reviewed studies were rated as “high” or “low” according to the followings: “high”=less than 3 unmet criteria; “low”= 4 or more unmet criteria (Table 1). [i] Criterion not met (-); Criterion met (+); H=(high) less than 3 unmet criteria; L=(low) 4 or more unmet criteria. The search process is shown in Figure 1. The majority of the studies (n=298, 60.3%) were discarded during the abstract review phase due to inclusion of non-cancer-related surgery patients or non-GI cancer surgery patients: orthopedic, vascular, cardiovascular, and pulmonary. Some of the excluded studies combined GI and non-GI cancer surgical patients but did not make clear distinction. In 97 (18.5%) articles, patient population was limited to those receiving care in ICU or post-anesthesia care unit. Also, studies that focused on pediatric patients or included age groups other than the geriatric population (n=57, 11.5%), and patients diagnosed with mental disorders, alcohol addiction or alcohol withdrawal syndrome preoperatively (n=20, 4.0%) were excluded. Full-text review revealed further study exclusion. Studies that did not make a clear distinction exclusively to elective abdominal surgery patients (n=31, 56.4%) were excluded. Also, studies that did not focus on reporting predictive factors or characteristics of POD patients (n=13, 23.6%), were not conducted in ward (n= 9, 16.4%), or were ongoing studies with no conclusive data (n=2, 3.6%) were excluded. Finally, 11 studies that satisfied all inclusion criteria were included in this integrative review [12- 22]. These studies were all quantitative studies, and qualitative studies that met inclusion criteria were not found. Most of the 11 studies examined prevalence and predisposing factors of POD. On the other hand, two focused on the role of surgical method and nursing method in POD prevention. The sample size varied among the studies, with some enrolling as few as 20 and some included as many as 517. As for the study design, 7 (63.6%) employed a prospective research design, 2 (18.2%) used retrospective research design, and 2 (18.2%) incorporated randomized clinical trial design. Some studies included homogeneous surgery types (n= 6, 54.5%), whereas some included heterogeneous surgery (n=5, 45.5%). Summary of included studies is shown in Table 2. Flow diagram of the search and review process according to the PRISMA guideline. Hepatic To investigate and identify the occurrence and related factors of postoperative delirium in elderly patients undergoing major abdominal surgery Approximately half of the elderly patients in the study developed postoperative delirium. 2 Morimoto et al. (2009) Japan Prospective cohort 20 (65 and over) Colorectal To evaluate the relationship between patient factors, including cerebral oxygen saturation, and the incidence of postoperative delirium Patients’ age, low preoperative kana-hiroi test score, and low preoperative cerebral oxygen saturation were important risk factors for postoperative delirium. 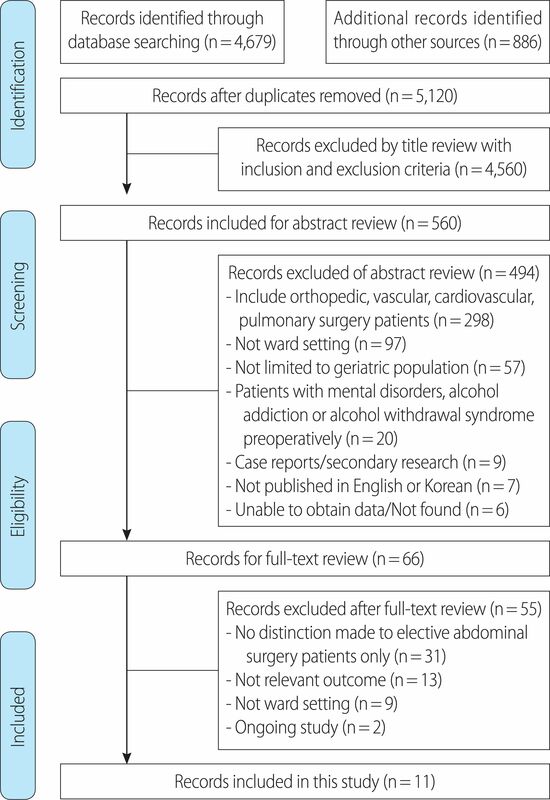 Hepatic To determine the incidence, risk factors and outcomes of postoperative delirium among patients aged 65 and above undergoing elective abdominal surgery at a surgical ward with a high standard delirium care At a surgical ward with high standard delirium care, the incidence of delirium was 24%. Age was a significant risk factor for postoperative delirium and mortality was higher in delirious patients undergoing elective abdominal surgery. Hepatic To determine incidence, duration, and risk factors for postoperative delirium in elderly patients undergoing major abdominal surgery Postoperative delirium is a frequent and severe postoperative event in elderly patients after major abdominal surgery. A perioperative geriatric assessment should be recommended to patients with an American Society of Anesthesiologists status of 3-4 and preoperative impaired mobility to facilitate the management of postoperative delirium. In high-risk patients, the postoperative administration of tramadol should be avoided. 5 Patti et al. (2011) Italy Prospective cohort 100 (65 and over) Colorectal To investigate the incidence and risk factors for postoperative delirium in 100 consecutive patients over 65 years who underwent colorectal surgery for carcinoma Postoperative delirium is a frequent complication after colorectal surgery for carcinoma. 6 Jia et al. (2014) China Randomized clinical trial 233 (70-88) Colorectal To investigate the role of fast-track surgery in preventing the development of postoperative delirium and other complications in elderly patients with colorectal carcinoma Fast-track surgery decreases the length of stay, facilitates the recovery of bowel movement, and reduces occurrence of postoperative delirium and other complications in elderly patients with colorectal carcinoma compared to traditional perioperative management. The lower incidence of delirium is at least partly attributable to the reduced systemic inflammatory response mediated by IL-6. 7 Tei et al. (2016) Japan Retrospective cohort 311 (75 and over) Colorectal To determine the incidence of and risk factors for postoperative delirium in patients with colorectal cancer who had undergone laparoscopic colorectal resection The risk of postoperative delirium is associated with older age, operative approach, organ space surgical site infection. 8 Ito et al. (2016) Japan Retrospective cohort 146 (70 and over) Pancreatic To investigate the incidence and risk factors for delirium after pancreaticoduodenectomy The Charlson Age Comorbidity Index, especially in elderly patients, was associated with the incidence of postoperative delirium. Hepatic To determine whether carrying out the Comprehensive Geriatric Assessment (CGA) before operations would be useful for predicting complications, particularly postoperative delirium, in old-old patients The CGA before gastrointestinal surgery can be a useful tool for predicting the development of postoperative delirium in old-old patients. 10 Xiang et al. (2017) China Prospective cohort 160 (65 and over) Colorectal To investigate the relationship between C-reactive protein (CRP) and postoperative delirium in elderly patients undergoing laparoscopic surgery for colon carcinoma Preoperative CRP concentrations are predicator for postoperative delirium in patients undergoing laparoscopic surgery for colon carcinoma. Pancreatic To examine whether a modified Hospital Elder Life Program (mHELP) reduces incident delirium and length of stay in older adults undergoing abdominal surgery For older patients undergoing abdominal surgery who received the mHELP, the odds of delirium were reduced by 56% and length of stay was reduced by 2 days. The operational definition describing delirium is applied to POD when the clinical manifestations of delirium appear after surgical operation. Delirium refers to acutely altered and fluctuating mental status with signs of altered level of consciousness and inability to maintain attention [12-22]. This condition cannot be explained by any other neurocognitive disorder and has a sudden onset. Studies have described three motor subtypes of delirium where each shows different symptoms: hyperactive, hypoactive and mixed [15,17-19,23]. For hyperactive delirium, patients usually present restlessness, irritability, agitation, hallucinations, delusions, and are very often combative [18,19]. Patients experiencing hyperactive POD are more likely to be noncompliant with treatment regimen and are at risk for harming themselves and other healthcare personnel from their aggressive behaviors. Contrary, hypoactive POD presents with decreased responses, alertness, motor movements, lethargy, abnormal thought process, and patients tend to be slow in responding to stimulation and questions [14,21]. Patients presenting both hyper-active and hypoactive POD symptoms are categorized as mixed motor subtype [12,13]. These varying symptoms are usually recognized by nurses, and we recommend perioperative nurses caring for GI cancerdirected geriatric patients to carefully assess for these signs. POD prevalence rate varied among studies ranging from 8.2% to 51.0%. Several factors may possibly contribute to this disparity. Different inclusion criteria such as cancer type, surgical sites, age range, preoperative cognition, medical status, drugs used for premedication and anesthesia peri/postoperatively may have caused the wide range of prevalence rate. Nevertheless, this review has shown that as much as half of the geriatric patients receiving GI cancer-directed surgeries develop POD in ward settings. Compared to past reports on cardiothoracic and orthopedic patients that showed incidence rate to be approximately 8-35% following operations involving general anesthesia, the prevalence may increase when it comes to GI cancer-directed surgeries suggesting a need for further investigations . From reviewing included studies, several prognostic factors of POD were identified as shown in Table 3. We categorized these factors into patient-specific and surgery-specific factors. Patient-specific factors refer to the characteristics that can be identified prior to surgical procedures including older age [14,16,18,20,21], low baseline cerebral saturation , cognitive impairment [12,16-18,21], declined motor function [12,17,21], decreased preoperative serum calcium or albumin levels [12,20] and presence of comorbidities [14,21]. Surgery-specific risk factors that put patient body at more stressed state include the followings: invasive preoperative preparation (e.g. mechanical enema, nasogastric tube insertion) [13,15], blood transfusions [12,19], greater blood loss , crystalloid infusions [19,20], cardiovascular events [20,22], longer operation hours , longer hours spent to recover from general anesthesia , inflammatory response mediated by proinflammatory cytokines , delayed feeding , and postoperative analgesic administration [12,15]. [i] POD=Postoperative delirium; MMSE=Mini mental state examination; HDS=Hasegawa dementia score; CST=Cognitive screening test; MRI=Magnetic resonance imaging; NR=Not reported; CAM=Confusion assessment method; EMR=Electronic medical records; DSM-IV=Diagnostic and statistical manual of mental disorders-IV; DRS=Delirium rating scale; DOS=Delirium observation scale; DRS-R -98=Delirium rating scale-revised-98; ASA=Anesthesiologists physical status classification system; ADL=Activities of daily living; TGUG=Timed get up and go test; PNI=Prognostic nutrition index; Oran/space SSI=Organ space surgical site infection; CACI=Charlson age comorbidity index; IADL=Instrumental activities of daily living; GDS=Geriatric depression score; MCCI=Modified charlson comorbidity index; CRP=C-reactive protein; mHELP=modified hospital elder life program. The majority of the literature has supported the notion that advanced age is an independent risk factor of POD. Aging process puts geriatric patients more susceptible to decreased homeostatic regulation capacity, which becomes more prominent when the patient undergoes major surgical procedures that require general anesthesia. Ample data has indicated aging to be associated with cerebral changes such as stress-regulating neurotransmitter proportion changes, reduced brain blood flow, decreased vascular density, neuron cell death, and disrupted intracellular signal transduction systems [25,26]. The aging process accumulates oxidative damage to cells and tissues and reduces antioxidant mechanism, which causes cerebral damage and may trigger delirium. Age-related brain changes make elderly patients inevitable of having higher risks of POD. Similar to most of our included study results, a recent observational, longitudinal study conducted on hospitalized, medically ill patients has revealed that delirium risk increases from 3% for ≤ 65 years to 14% for 65 to 74 and 36% for those ≥ 75 years of age [16,27]. POD in older patients usually is preceded with prodromal phase where patients present restlessness, anxiety, irritability and sleep disturbances which develop gradually . As it is evident that POD is common in this population, we recommend nurses to assess for prodromal phase preceding the sudden onset of POD. Geriatric patients are most often characterized with frailty which increases vulnerability to surgical stress. Frailty is described with common phenotypes of hemodynamic instability, functional impairment, cognitive dysfunction, general weakness and malnutrition . It may be that these phenotypes interchangeably play role in multidimensional cause of POD as they are closely related to the associated factors identified in our review. Hemodynamic instability is linked to the low baseline cerebral saturation. Although not evidently described in the included studies, low baseline cerebral saturation may have triggered hypoactive POD development post-surgery. Hypoperfusion has been indicated to increase cerebral hypoxia during and after surgical procedures, which reduces acetyl coenzyme A, glutamate and acetylcholine synthesis in the citric acid cycle . This reduction results decreased cholinergic and glutaminergic brain activity, which then may lead to hypoactive POD. The dopamine-to-norepinephrine conversion process in the brain is oxygen dependent, which allows to assume that hypoxic state will lead to great accumulation of dopamine [25,29]. Dopamine is associated with calcium channels, and increased dopamine results in an intracellular calcium influx, which consequently lead to brain mitochondrial oxidative phosphorylation [22,25,26]. This process causes clinical manifestations of hyperactive POD including agitations, aggressive behaviors, delusions and hallucinations. Many have shown that intraoperative oxygen saturation to be positively correlated with postoperative cognitive and motor functions, which is in accordance with our review results [12,21,26]. It may be that the degeneration of brain neurons and the milieu of neurotransmitters cause POD . In our review, preoperative serum calcium or albumin decline was indicative of POD. These factors may be translated as malnutrition in elderly population, which increases POD risk from reduction in glucose supply and amino acid deficiencies that are critical for adequate metabolism [26,30]. As the patient-specific factors that may influence elderly patients receiving GI-cancer surgeries are closely related to frailty phenotypes, nurses should assess for these characteristics preoperatively to identify high-risk patients. Surgery-specific factors identified in the included studies are associated with GI-cancer surgery complications such as blood loss, cardiovascular events and inflammation. GI-cancer surgeries usually involve longer operation hours compared to minor surgeries, which puts patients at a greater risk for bleeding, sepsis, and complications associated with intraoperative medication use [18,20]. The correlation between blood loss amount and POD is thought to be due to the hypoxia in the cerebral cells, which triggers decreased brain oxidative metabolism leading to abnormal neurotransmissions, cerebral dysfunction and behavioral changes [12,19,22]. Intraoperative blood loss most likely leads to blood transfusions. A number of studies conducted on cardiothoracic surgeries have demonstrated that blood transfusions during surgery increase odds of POD [12,19]. Nevertheless, factors that may influence patient’s cardiovascular system and circulation increase the odds of altered neurocognitive function after surgical procedures. Cerebral autoregulation and cerebral arterial pressure play an important role in maintaining brain perfusion and function . As some of our included studies have indicated, geriatric patients receiving GI-cancer surgeries tend to have coexisting conditions (e.g. hypertension, diabetes mellitus) and are on multiple medications, which were suggested to be predisposing factors of POD [14,16,21]. It has been suggested that these comorbidities in elderly population, combined with decreased arterial elasticity, affect the cerebral autoregulation and cerebral arterial pressure, which becomes more prominent during operations involving anesthesia . Geriatric patients who had large variance in intraoperative blood pressure fluctuations were more likely to develop delirium after surgery . The invasive surgical operations trigger peripheral inflammatory process, which induces inflammatory mediator release that may elicit episodes of delirium. In accordance with previous studies that reported several inflammatory cytokines and mediators to be responsible for POD, enhanced proinflammatory cytokines including interleukin-6 and septic conditions were found to be more prominent in delirium patients [15,21]. Preventative measures for POD may be the optimal choice in reducing the incidence rate. Thorough pre/postoperative assessments are essential for early detection and diagnosis. Impaired cognition prior to surgical procedures indicates high-risk POD patients, and, therefore, most of the included studies conducted preoperative cognitive function tests. The purpose of such assessments was to exclude patients with severe cognitive impairment, to test the ability of cognitive assessment tool to predict POD, and to detect cognitive alterations after surgery. The most widely used to quantify cognitive function was the Mini Mental State Examination (MMSE), a 30-point questionnaire (ranging from 0 to 30, with 24 and above indicating “normal cognition,” 19-23 meaning “mild impairment,” 10-18 meaning “moderate impairment” and 9 and below meaning “severe impairment” [12,13,17,19,20,22]. Other assessment tools such as Hasegawa Dementia Score (HDS) and Kana-hiroi-test , Cognitive Screening Test (CST) , and cranial magnetic resonance imaging scan (MRI)  were used for the same purposes. Among these various assessment tools, we recommend the use of MMSE which is fairly easy to apply and has proven validity and reliability [12,13,22]. As for postoperative assessment, either single or a combination of two separate delirium-related tools was incorporated after the patients have recovered from the general anesthesia. Most widely used tool was Confusion Assessment Method (CAM) (63.6%) where trained nurses assessed for 4 classic POD-related characteristics: (1) acute and fluctuating changes in mental status; (2) inattention; (3) disorganized and incoherent thinking; and (4) altered levels of consciousness [12,13,17, 19-22]. The diagnosis of POD was made in all 7 studies if the patient showed presence of features (1) and (2) and either (3) or (4). This tool is an easy-to-use and straight-forward method, which has shown reliability and validity in POD assessment [19-21]. Diagnostic and Statistical Manual of Mental Disorders 4th edition (DSM-IV) criteria was used in 3 studies, which defined delirium if the patient presented with any one of 4 symptoms that showed signs of cognitive disturbances [14,16,18]. Patients who scored 12 or more points on the Delirium Rating Scale (DRS) were categorized in to delirium group in 2 studies [18,20]. Also, Delirium Rating Scale-Revised-98 (DRS-R-98), a revised version of DRS, was used to evaluate the cognitive domain of delirium for attention, orientation, short-term and long-term memory, and visuospatial ability where to total score of 18 or more defined delirium . Similar to DRS and DRS-R-98, 13-item Delirium Observation Scale (DOS) was used for potential risk for POD development . In 8 studies that indicated screening frequencies, patients were evaluated once, twice or 3 times a day for POD or possible cognitive shifts. For convenient use in clinical settings by nurses, we recommend the use of CAM and DRS-R-98. These two scales are the most suitable for nursing use to optimize holistic nursing care. Although not all studies have investigated complications that arose from POD, the results of those that have identified patient outcomes were in accordance with previous study outcomes that have assessed cardiothoracic or orthopedic patients in ICU. Patients, who have developed POD tend to have significantly longer hospital stay, had more postoperative complications, were more likely to be transferred to ICU, had higher mortality rate, took longer mean time to be able to tolerate solid diet and longer mean time to pass flatus, had higher rate of being discharged to long-term care facilities, and were more likely to develop recurrent POD [12-14,16,19,20,22]. Longer hospital stay was closely related to postoperative complications such as postoperative incision infection, pulmonary infection, cardiovascular events and septic complications [12,14,22]. In one study that investigated postoperative course depending on presence of POD, the mortality rate of POD patients was 14% which was most closely related to septic complications . In the respect that POD is a multifactorial phenomenon, an integrated nursing approach is needed in providing geriatric patient care. POD treatment requires a multicomponent strategy, but clinicians largely rely on pharmacologic management only. Depending on the motor subtype of POD, pharmacological treatments involving sedatives such as haloperidol and benzodiazepines are considered. However, these pharmacological treatments are limited to acute physiologic symptom management and may pose side effects including oversedation and prolonged delirium. Therefore, we suggest that the aims of geriatric GI-cancer surgical patients should focus on optimizing preventative measures by assessing and identifying high-risk patients. Prior to implementing any treatment strategies, assessment for an underlying cause should be performed. It has been indicated that environmental and supportive nursing interventions such as proactive geriatric consultation, orienting communication method, oral and nutritional assistance, early mobilization, music therapy and lighting adjustments were found to have positive effects on preventing POD . One of the included studies has shown that nursing management protocol that contains elements mentioned above to be effective in POD prevention . In addition to proper screening for risk factors, we suggest POD educational nursing protocols that promote hydration, safety management, manage stress and family interactions that may help in maintaining adaptive cognitive functioning. The cancer landscape has been changing dramatically with aging population worldwide . This epidemiologic trend has brought forth a distinctive health concerns that are closely related to age. Now that advanced age is no longer a contraindication for GI cancer surgeries, the number of geriatric patients receiving postoperative nursing care has increased which emphasizes nurses to focus on identifying, assessing and managing age-related postoperative complications. Our review may be limited by including a relatively small number of studies that are published in languages in English or Korean only. There were also limitations in the included studies themselves such as mean age differences, surgical procedures and methodologies. Despite the limitations, we provide a compelling evidence that the POD poses challenges in identifying and providing treatment in timely manner. Also, we show that nursing assessment and management skills are critical in enhancing geriatric GIcancer surgical patient outcomes. Prompt nursing assessment and recognition of POD will not only contribute to improved early diagnosis and treatment, but also improve quality of perioperative care socially and financially. Nurses may easily identify high-risk patients using MMSE and assess for POD using CAM and DRS-R-98. Further investigations specific to general ward settings and homogenous GI cancer-directed surgeries may further deepen our knowledge on POD. Studies investigating POD according to the three motor subtypes will also open pathways to enhancing POD management. We suggest future researchers to establish adequately powered, large scale studies and to develop POD nursing algorithm specific to geriatric patients to optimize nursing care.